This recipe is an update from an older recipe. Over the years I’ve tinkered very slightly but I felt this vegetarian paella deserved a little refresh. 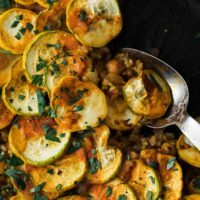 Don’t be confused, it’s not a ratatouille- I just love the look of the layered vegetables. Also, this is not a traditional paella. Quite a bite is different (including the type of rice used) but it’s a paella in spirit. A couple notes. You will see I partially precook the rice. I’ve never had luck with brown rice cooking in tomato-based liquids (and from comments I received, neither have a lot of people). Since I primarily make this with short grain brown rice, the instructions are very specific for this kind of rice. Also, you won’t see saffron in the dish (a very integral part to a classic paella). I’m including it in the variations- it’s an expensive spice that is not always the easiest to source. Saffron: Crumble a pinch of saffron threads into the broth for a more traditional flavor profile. 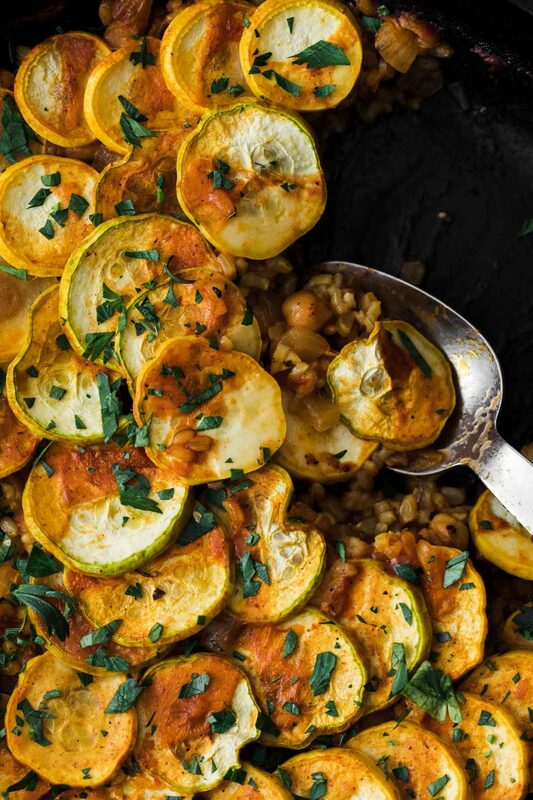 Seasonal: Use your imagination for how you can top this vegetarian paella. During the fall, use winter squash or sweet potatoes. For spring, asparagus and peas are lovely. It’s hard to go wrong. Beans: Chickpeas hold up the best in this dish but I’ve also used larger white beans (cannellini) in a pinch. The larger bean makes for another layer of the beautiful presentation. 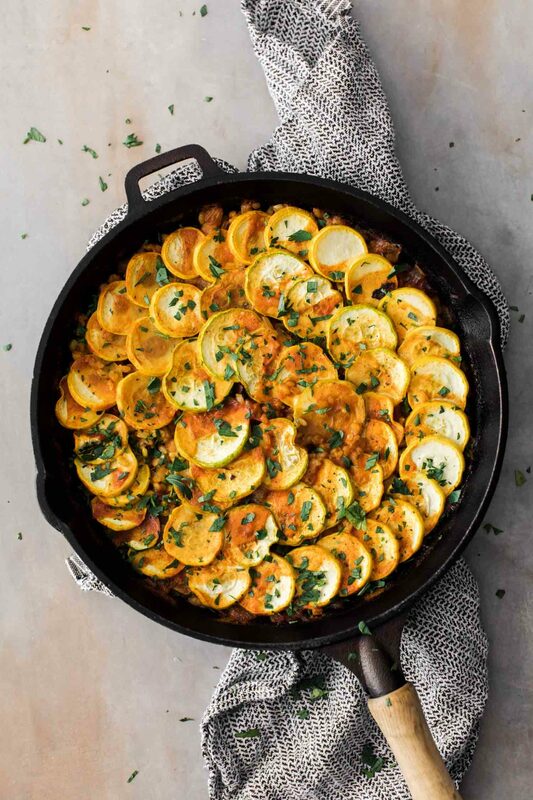 A seasonal, vegetarian riff on the classic, this paella is a beautiful main course that’s the perfect weekend or date-night dinner. Bring 2 cups of water to a boil and add the rice. Reduce to a simmer, cover, and, cook for 25 minutes. While the rice is cooking, In a 8″ cast iron skillet, heat 1 tablespoon of olive oil over medium heat. Stir in diced onion and minced garlic, cooking for 4-5 minutes. Next, add 1/2 tablespoon smoked paprika, and 1/2 teaspoon turmeric; cook for one minute. Next, add the roughly diced tomato, chickpeas, and 1/2 teaspoon of salt and pepper. Give a good stir and cook until tomatoes start to boil, 3-4 minutes. Stir in the cooked rice and ½ cup of the hot rice water. Finish with the vegetable broth then layer the zucchini/squash on top. Continue to cook until the rice is tender and liquid has been absorbed; 30 or so minutes. The goal is to leave it cooking for 5 or so minutes longer so the rice on the bottom is crisp. Serve with a sprinkle of parsley and lemon juice. Tips + Tricks: This recipe is specific to using short-grain brown rice. I’ve found this type of rice doesn’t cook well in tomatoes, hence the pre-cooking. If you decide to use a different variety of rice (like the rice traditionally used in paella), don’t pre-cook. I would try this with pearled spelt. That does cook very well with canned tomatoes.